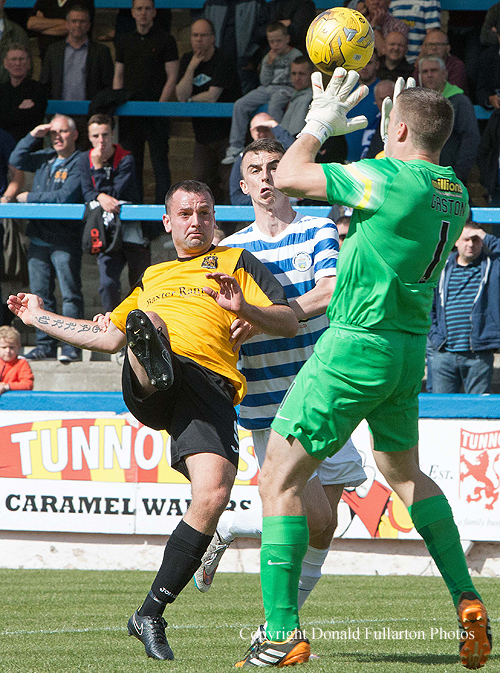 DUMBARTON achieved only their fourth win in 25 attempts in the Petrofac Training Cup first round at wet then sunny Cappielow Park, Greenock. DUMBARTON achieved only their fourth win in 25 attempts in the Petrofac Training Cup first round at wet then sunny Cappielow Park, Greenock in front of some 1,480 spectators. The 3-2 local derby win in his first competitive outing as manager was a real boost for Stevie Aitken and his new look squad, and the victory was thoroughly deserved. Grant Gallagher opened the scoring early on with a header from a Willie Gibson cross, and a few minutes later added a second when his long range shot was deflected by a defender out of reach of keeper Derek Gaston. They were in command for most of the first half, and remained 2-0 ahead at the interval. To the credit of Jim Duffy's men they battled hard throughout the second period, but it was Sons who went 3-0 ahead when Garry Fleming sent a stunning lob over Gaston and into the net (pictured). The home side rallied with first a free kick and then a penalty by their captain Peter MacDonald, but the visitors showed commendable confidence and control to prevent any further chances in the final five minutes.